DENVER -- Adam Foote wasn't a prolific scorer or a particularly flashy skater during 19 NHL seasons, but the hard-nosed defenseman was as valuable to the Colorado Avalanche as superstar teammates Joe Sakic, Patrick Roy and Peter Forsberg during the franchise's glory days. 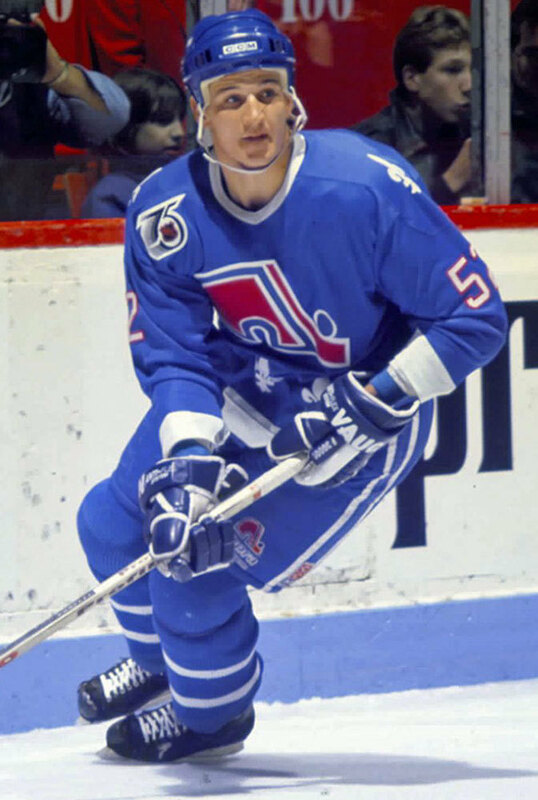 A rugged 6-foot-2, 220 pounds, Foote was the heart and soul of a defense corps that helped the Quebec Nordiques/Avalanche franchise win nine consecutive division titles from 1994 through 2003, along with Stanley Cup championships in 1996 and 2001. It's why Foote, who retired following the 2010-11 season, will have his No. 52 jersey raised to the rafters Saturday in a pregame ceremony at Pepsi Center before the Avalanche face off against the Montreal Canadiens. "It's huge honor, and I'm going up to where my buddies already are, guys I went into battle with," Foote, 42, told NHL.com, referring to the banners holding retired digits belonging to Ray Bourque (No. 77), Roy (33), Sakic (19) and Forsberg (21). The Nordiques retired the numbers of four players: J.C. Tremblay (3), Marc Tardif (8), Michel Goulet (16) and Peter Stastny (26). Described as a warrior by Avalanche center Matt Duchene and intense by right wing Alex Tanguay, who played with him on the 2001 Cup-winning team, Foote revealed it took him a while to accept his role as a shutdown defenseman who wouldn't be required to contribute much on offense. The Nordiques' second-round pick (No. 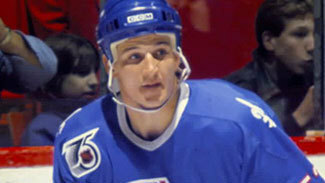 22) in the 1989 NHL Draft, Foote had 18 goals and 51 assists in 59 games his final season of junior with the Sault Ste. Marie Greyhounds of the Ontario Hockey League in 1990-91. "No one knows this, but I didn't like my [defensive] role at the start," said Foote, who, ironically, is in his first year as a defensive development consultant with the Avalanche. "I was more of an offensive player growing up in junior, and I got put in a role of playing against the top lines. Some guys can do that and play top power play. There were some guys better at it, but I was not at ease with that role for a very long time. When you start hearing compliments from players you played against, that made it a little bit easier. "I was a guy who wanted a bigger role. [Former Avalanche assistant coach] Bryan Trottier was one of the first guys who let me play more power play. Then, all of a sudden, I guess I grew up and realized we need all different kinds of players to win. I was older and more mature. I was at peace with myself probably the last five or six years of my career with that role. I enjoyed it and relished it." Foote never approached his junior statistics in the NHL. He had career highs for goals (11) and points (31) in 2002-03, and finished with 66 goals, 242 assists and 1,534 penalty minutes in 1,154 regular-season games. Yet he is the second-highest scoring defenseman in Avalanche/Nordiques franchise history with 56 goals and 203 assists in 967 games. He had seven goals, 35 assists and 298 penalty minutes in 170 Stanley Cup Playoff games. Foote, Sakic and Forsberg began their NHL careers in Quebec. The Nordiques were sold and moved to Denver in time for the 1995-96 season, which turned out to be a championship campaign. "We were just a bunch of young, naive kids," Foote said. "I don't think we realized how good we were when we came here. I was fortunate to play with great players and to be part of a group where the ownership and management were able to keep us together for a long time. We had lots of wins, and we would have liked to have won more Cups, but that shows you how hard they are to win." The Avalanche might not have won the Stanley Cup for a second time, against the New Jersey Devils in 2001, if Foote hadn't scored a first-period goal in Game 6 at the Meadowlands. The Avalanche trailed 3-2 in the series and were being badly outplayed when Foote took a shot from the blue line that beat Devils goalie Martin Brodeur. "I just remember Chris Dingman hitting a guy, maybe Scott Gomez, in the neutral zone to pop the puck loose," Foote said. "I just hopped on it and came across the line, and it went in blocker side. It's one where I put the puck against the grain. I didn't pick a corner or anything like that, just put it at the blocker side. It didn't matter who scored; we just needed to get a goal." The Avalanche went on to win 4-0, then returned home for a 3-1 victory in Game 7 to win the Stanley Cup. "His skill was underrated," Tanguay, who scored two goals in Game 7 against the Devils, said of Foote. "He might have gotten to play on the first power-play unit with some teams. Here you had [Sakic] playing the point and Ray Bourque or Rob Blake. What a lineup we had. But he was [all-round] a great defenseman. The biggest asset that I think he had that people didn't realize was his skating ability. For a guy who was as rough as he played and as big as he was, he was a really good skater. "Rob Blake and Ray Bourque got a lot of accolades for their offensive ability, and they were great players, but Footie was kind of that mean son of a gun who would put a guy's face through the glass and score on the next shift or get an assist on the next shift. What he did wasn't super flashy, but he's the type of guy who adds to a winning team." Foote had plenty of physical battles in the corners with forwards including the Detroit Red Wings' Brendan Shanahan and the St. Louis Blues' Keith Tkachuk. in the second-round (No. 22) of the 1989 NHL Draft. "They were big men," Foote said. "I enjoyed it when those guys came in. That was a battle in an area where I felt real comfortable. When guys were coming through the neutral zone with speed and you had to back up, that was kind of boring to me. I enjoyed the corner battles more. It was more fun." Of the fierce playoff series the Avalanche had with the Red Wings, Foote said, "Just two great teams going at each other trying to win a Stanley Cup." Duchene, who grew up idolizing the Avalanche, got to play with Foote for two seasons, starting with his rookie year of 2009-10 when Foote succeeded Sakic, who had retired, as captain. "He was a heart-and-soul type guy that you love having in the room, who makes you laugh and keeps guys honest as well," Duchene said. "I learned a lot of great lessons from him. I feel very fortunate to have had him in my life very early in my career. He was very vocal, always talking, always joking around, giving good speeches in between periods. He was almost like a player-coach. He knew the game very well, and he's obviously been helping our defense this season." Foote represented Canada in the Winter Olympics in 1998, 2002 and 2006, and he helped Canada win the gold medal in 2002 in Salt Lake City. He won gold and was named to the All-Tournament Team at the 2004 World Cup of Hockey. "The playoffs are a long grind, mentally and physically," he said. "I didn't realize how huge the Olympics were until I got there. In 2002, I didn't want to make a mistake and be the reason why Canada didn't win the gold and have to live with that. It was very stressful. There was a lot of pressure, but it was wonderful to win." Foote left the Avalanche as a free agent in 2005 to sign with the Columbus Blue Jackets. He returned in a late-season trade in 2008, and he's looking forward to becoming a fixture of sorts at Pepsi Center. "To me, it puts everything at peace," Foote said. "There will always be a home for my family. My boys will never feel alone knowing that my jersey is up there." Foote and his wife, Jennifer, have two sons, Cal and Nolan, whom he is coaching with the Colorado Thunderbirds program. "It's a blast," he said. "It's the only thing close to playing, and because it's my kids, I probably enjoy it more than playing. I love it. To see them develop and to give back to the game, it's something we should all do. I don't know where it will go, but right now, I'm super fortunate." Asked how he would like to be remembered as a player, Foote said he would leave that to others. "I was just raised to work hard and to try and do your best," he said. "We were owned by the fans. We went out and worked hard for them. I just tried to have a good work ethic. My dad always told me that people usually are OK with you if you work real hard for them and give [100 percent] effort. That's the way I tried to approach things."